Not long ago, I pulled from my bookshelf a 1961 copy of C.S. 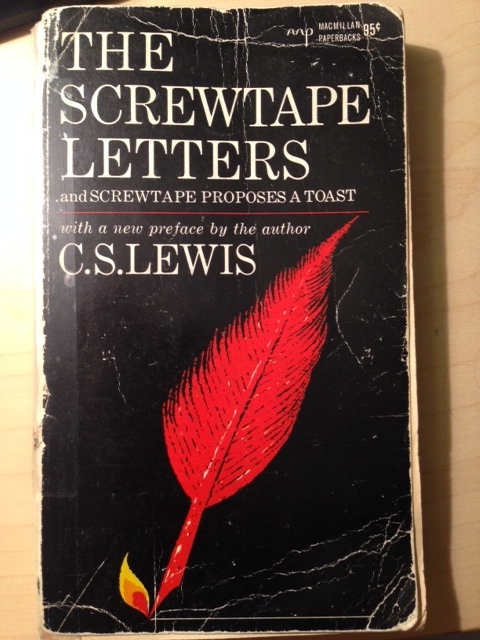 Lewis’ The Screwtape Letters and began to read the first few chapters. This particular copy had belonged to my dad when he was a teenager and was the same copy I read when I was in high school 12 years ago. As you can see, the binding’s a bit loose and the title page has been reattached with some tape – can’t remember if that was my handiwork or if I inherited it that way – but most impressive, the jacket says this book originally cost $0.95, which I’m told by this website is worth $5.70 in 2013 dollars. Oh, the good ol’ days! you don’t realise how enslaved [humans] are to the pressure of the ordinary. I once had a patient, a sound atheist, who used to read in the British Museum. One day, as he sat reading, I saw a train of thought in his mind beginning to go the wrong way. The Enemy, of course, was at his elbow in a moment. 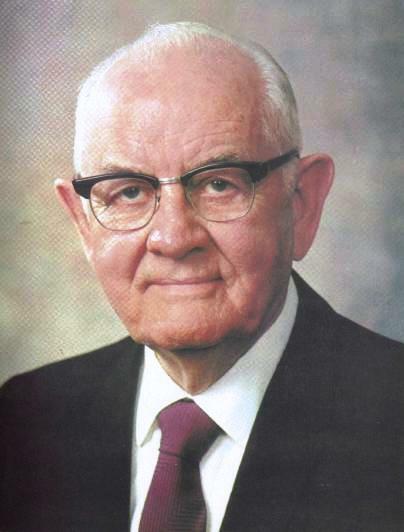 Before I knew where I was I saw my twenty years’ work beginning to totter…I struck instantly at the part of the man which I had best under my control, and suggested that it was just about time he had some lunch. The Enemy presumably bade the counter-suggestion (you know how one can never quite overhear what he says to them?) that this was more important than lunch. At least I think that must have been His line, for when I said, “Quite. In fact much too important to tackle at the end of a morning,” the patient brightened up considerably; and by the time I had added “Much better come back after lunch and go into it with a fresh mind,” he was already halfway to the door. Once he was in the street the battle was won. I showed him a newsboy shouting the midday paper, and a No. 73 bus going past, and before he reached the bottom of the steps I had got into him an unalterable conviction that, whatever odd ideas might come into a man’s head when he was shut up alone with his books, a healthy dose of “real life” (by which he meant the bus and the newsboy) was enough to show him that all “that sort of thing” just couldn’t be true. My experience leads me to believe that we are indeed slaves to the pressure of the ordinary, perhaps even more so today than in 1942 when Screwtape was first published. Nowadays, it’s so easy to let our phones, the news, and other gadgets consume our time, thought, and attention. I’m certainly not perfect at shutting off and powering down the electronics in my life, but I have found that there is immense value in taking some time each day for personal solitude. Sometimes I’ll write down some recent learning experiences, the things I’m grateful for, or my desires and goals. Other times I’ll write questions or observations I’ve had. Combined with prayer and reflection on some meaningful scriptures, I find these practices make it easier to arrive at a spiritual center. This aligning of our souls creates an environment where we just might receive the messages God wants us to receive. Doing so likewise strengthens our capacity to recognize destructive influences which may initially seem so subtle and harmless.